There were 29 players to start the day in Event #4: $1,500 Omaha Hi-Lo Split 8 or Better but at the end of the day it was Benjamin Zamani who was crowned the winner. At one point on Saturday he was multi-tabling, playing both Omaha and Event #8: $333 WSOP.com ONLINE No-Limit Hold’em. 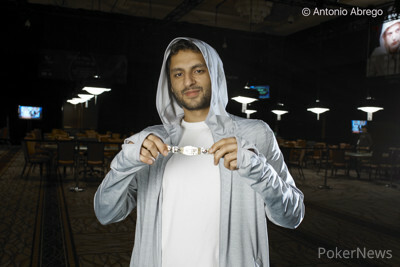 He busted the online event but was able to lock up his second WSOP gold bracelet in Event #4. Several players dropped very quickly at the start of the day, bringing the field two tables within the first two levels. Two-time bracelet winner Marco Johnson was searching for his third bracelet but he was eliminated in 23rd place ($6,725) when Kevin Gerhart made a better two pair to send him to the rail. Also in the field today falling short was bracelet winner Jim Collopy, who fell in 17th ($8,246) when he could complete his flush draw to stay alive against Dustin Sitar. That left Zamani as the lone bracelet winner in the field. Start-of-day chip leader Christopher Logue couldn’t make it through to the final table either. He remained steady for the better part of the day, but as the limits raised, and chips were exchanged, Logue’s aces were cracked by Jared Hemmingway and he was eliminated from the tournament in 11th place ($13,008). 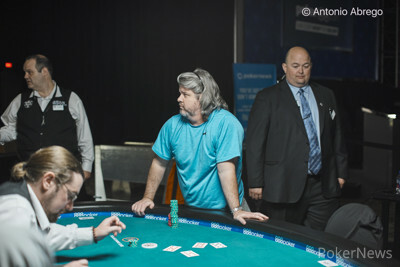 James Chen, who had a roller coaster of a tournament was the final table bubble boy. Chen, who was near the top of the chip counts for most of the tournament, found himself as the short stack coming into the final 10. “I had more chips at the end of day 1 than I do now,” Chen said as the players were moving tables. He would be eliminated quickly at the unofficial final table by Alex Ferrari. Hemingway took a hot start at the final table by eliminating both Dustin Sitar and Martin Corpuz. Hemingway found himself in big trouble against the two but caught running fives to scoop a massive pot. Out next was Scott Buller who ran into Ryan Paluf’s flush, eliminating him in 7th place ($28,948). Then Forrest Auel fell in 6th ($38,946) when Paluf caught a flush and Hemingway hit a better low and the two chopped up his stack. The table mostly quieted down after Auel’s Oregon-based rail left. With just four players left, Hemingway had a significant lead. Zamani trailed closely behind. Paluf dropped to the short stack when Zamani made a full house against him and moved into the chip lead. Paluf was eliminated in 4th place ($73,647) by Ferarri shortly after when Ferrari made a set against him. Zamani moved into three-handed play with the chip lead and pulled even farther away by taking pots off both players. Zamani and Hemingway ended up chopping up the last of Ferrari’s chips when he was eliminated from the tournament in third place ($103,471). Zamani cruised into the heads-up play with a huge chip lead and despite Hemingway’s efforts and several double ups, he was not able to overcome. Zamani made several wheels and applied pressure in all the right spots. In the end, Hemingway was left with just 20,000 chips and he was forced all in from the big blind. Zamani’s hand made two pair and a low and he locked up the tournament and the $238,620 first prize. Hemingway earned $147,428 for second. 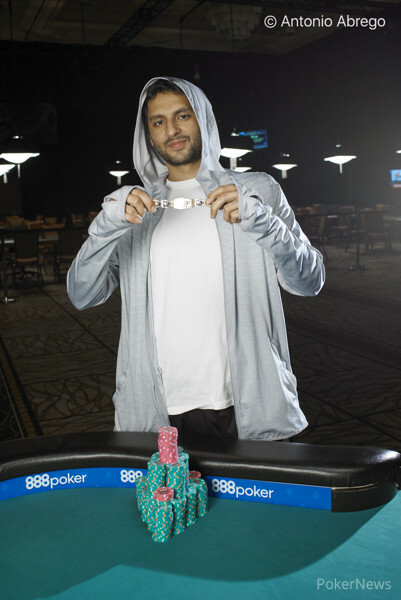 This is Zamani's second WSOP gold bracelet, putting him in the illustrious two-time bracelet winner’s club. Jared Hemingway was forced all in from the big blind with his remaining chips and cards were immediately turned on their backs. The board ran out giving Zamani a winning two pair and low and making him the winner of the tournament. For his efforts, Hemingway will collect $147,428. "Well, there's another story for the J books," someone on Hemingway's rail said. "The guy got here on a Greyhound and had to find a Coinstar for his buy in, and now he's walking away with $150,000." Benjamin Zamani raised from the button. Jared Hemingway called. The turn was the . Hemingway bet, Zamani raised. Hemingway called. The river was the and Hemingway bet. Zamani called. "Set," Hemingway said. He showed . But it was no good. Zamani showed for a straight and he scooped the entire pot, leaving Hemingway on fumes. Jared Hemingway raised from the button before Zamani came over the top. Hemingway then three-bet. Zamani four-bet and Hemingway five-bet all in for an additional 10,000. The board ran out to see Hemingway scoop the pot with two pair to see him rise to just under one million in chips. Players are on a short break before the last level of the night. Players have decided to play one more level tonight. If a winner is not crowned by the end of the level a hard stop will be enforced and play will end for the day and continue tomorrow. Jared Hemingway raised from the button. Benjamin Zamani reraised from the big blind while imitating Hemingways aggressive betting technique. Hemingway laughed, then called the bet. The flop was . Zamani led out. Hemingway raised. Zamani made it three bets and Hemingway called. The turn was the . Zamani bet and Hemingway called. On the river Zamani bet again. Hemingway called. "Wheel," Zamani said. Showing and with that, Hemingway slipped back into the danger zone. Benjamin Zamani raised from the button and was called by Jared Hemingway in the blinds. The flop came and Hemingway check-called a bet from Zamani. The turn brought the and once again Hemingway checked and opted to call a bet from Zamani. The completed the board and Zamani fired a final bet and was check-called by Hemingway. "Set!" said Zamani, before tabling his for a set of eights. "Nice hand," replied Hemingway, disposing his hand to the muck shortly after.